I love the red, pink, and orange color palette, and after last week's fight to quilt the Half Square Triangle Quilt, I needed a project where the focus was on easy, fun, and color! 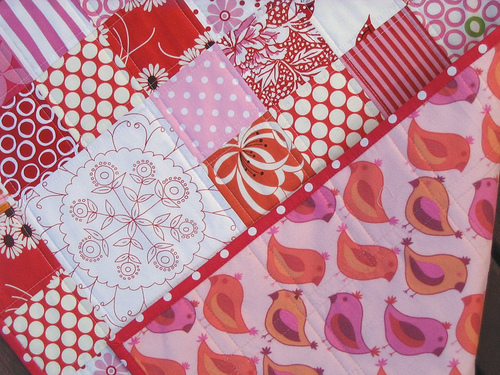 This baby girl quilt is made from 100% cotton fabrics and wadding. It is wonderfully lightweight and would be great to use as a crib/cot quilt, a play mat, a stroller blanket or even a change mat. It is machine pieced and quilted. The backing is made from a soft and cozy flannel fabric by Valori Wells. Love the flannel on the back!! So cute! I love the that you used flannel on the back. Let me know how ebay goes! I bet it sells right away!! Rita, I just love it! I think I can see making one of those in my future. I love it! That would look perfect on my bed - all my favourite colours. Seriously when do you sleep?! It is super gorgeous Rita. 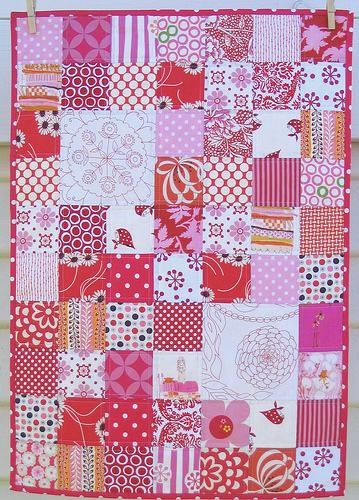 Love the larger squares and the backing is fabo. Good luck with ebay! Absolutely love your work and energy. Did you see you were mentioned on Sarah Fielke's blog "The Last Piece". Congratulations. Fantastic! 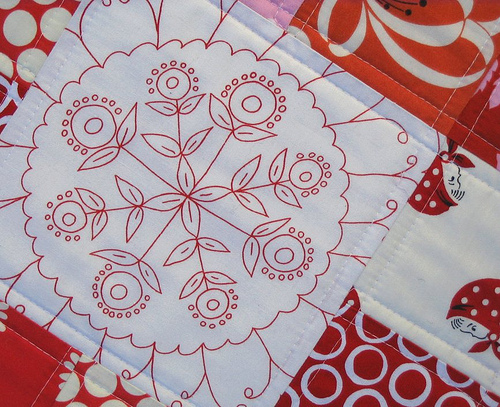 Love the backing but the two feture panels on the front are my faves.. gorgeous work Rita! Really nice work. Love the colors! It's so little princess and the back is just so darn cute, nice. adorable as always!! i want to be a fly on the wall of your studio for a day to see how you work! !